The Explorer allows you to navigate your connections, target objects, and manage your environments. You have accessed the Explorer from the Home Screen or directly from the menu. You have taken the appropriate steps to connect to your environment. Once you have connected to one or multiple environments, you can select whether to view one or all of them by selecting from the drop-down. To disconnect from an environment, hover your cursor over the name and click the disconnect icon. To refresh an environment, hover you cursor over the name and click the refresh icon. You can add an additional connection by clicking Add Connection. For more on connecting to an environment, see this page. You can search by name or by URL. You can select multiple search items by hovering over the results and clicking to add. To complete the search press Enter on your keyboard or click the search icon. 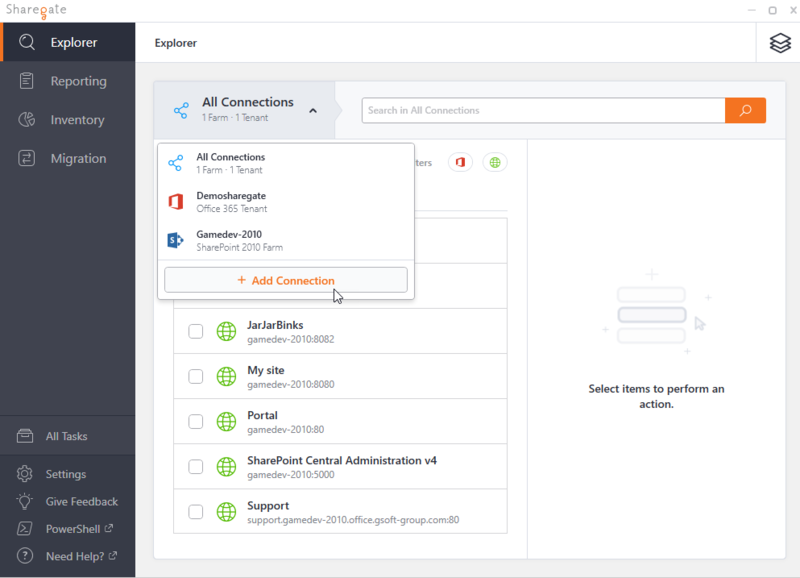 The Explorer list allows you to easily navigate your connected farms and explore the different objects (Web Applications, Site Collections, Sites, Documents, etc.). To drill down, simply double click on an object or use the Navigate button with appears when you hover your cursor over the object. You can drill down as far as possible using this method. To go back to a previous level, click on the breadcrumb. The Quick Actions menu is always available in the right pane. You can also access the contextual menu by right-clicking an object or by clicking the ellipsis (...) symbol to the right of the breadcrumbs. Select one or multiple Filters to display specific object types. You can run a report or manage your SharePoint security by clicking in the Quick Actions options. Quick Action only appear on the right panel when you select an item from your Explorer list. Duplicate Site Collection: Allows you to create a duplicate of an existing site collection. Edit: Allows you to apply a transformation to a site collection. Settings: Opens your site collection in the browser. Delete/Delete Permanently: Deletes the site collection. Delete Permanently cannot be undone. External Sharing Report: Find all the objects shared with External users or via anonymous guest links. Permissions Matrix Report: View all the permissions assigned to your subsites, lists, libraries, folders, documents, and items. Activate Auditing: Quickly activate audit event tracking on farms, web applications, and site collections. Available when at least one farm, web application or site collection is checked or highlighted. Note that this action is not available on public site collection. Audit Report: View the list of all the events that the users of a SharePoint environment have made on it. Note that this action is not available on public site collection. Auditing must be activated to run the Audit Report. Add Permissions: Grant permissions to sites and/or lists for multiple users/groups. Remove Permissions: Revoke permissions to sites and/or lists for multiple users/groups. Copy User Permissions: Copy the permissions from a source user to multiple users/groups. Check Permissions: Find all the access a specific user/group has on your SharePoint environment. Clean Limited Access: Remove all unnecessary "Limited Access" permissions. Clean Orphaned Users: Delete orphaned users (disabled in Active Directory) from farms, web applications and site collections. Break inheritance: Stop inheriting the parent's permissions by copying all of its permissions into the highlighted object. Available when highlighting a subsite, a list or a library. Restore inheritance: Remove all custom permissions, and use the parent's permissions instead. Available when highlighting a subsite, a list or a library with custom permissions. View the applicable permission types. View the list of external users. Displays a list of member within a site collection or group. The specific site properties such as name, title, description, and so on.